Over the past few years, Asian handicap has become one of the most popular alternative betting markets. It completely baffles inexperienced bettors, but for many it is the market of choice. What I will say is that once you get your head around the concept, Asian handicap betting becomes second nature. The aim is to give both teams a 50-50 chance of winning (even when there's a strong favourite). By giving one team a head start and the other a handicap to overcome, the match outcome becomes more of an even money shot. Asian Handicap odds also offer the very best value for football betting because of the margins that the bookies work to. Particularly in matches where one team is a strong favourite to win, it can provide a value option which you can use to side with the bigger teams. Imagine an FA Cup tie between Manchester City and Shrewsbury Town in which you're able to back the home win at even money! In this article, you will find Asian handicap explained in full so that you too can profit. I've even added a table for you to download for FREE! So... what's an Asian handicap bet and what do you need to know in order to start taking advantage? Asian handicap - also known as AH - is a form of spread betting and works in the same way as a regular handicap, with teams either given goals or having goals taken away from the total score. This type of betting originally became popular in Indonesia, with the term believed to have first been coined by journalist Joe Saumarez Smith. Since the turn of the century more and more people have been getting involved in this market and, in recent years, it has found a home in Europe where increasingly it is becoming the market of choice for many professional traders. What Asian handicap tries to do is to make each game a 50/50 decision. To do that, there is a handicap system where the favourite gets a negative handicap and the underdog is handed a positive handicap. For instance, Chelsea v Watford may see Chelsea get a -1.5 goal handicap and Watford +1.5 goals. If Chelsea win the game 1-0 and you backed them on the -1.5 goal handicap you would have lost your bet because Chelsea needed to win by 2 goals. However, if you had backed Watford on the +1.5 goal handicap you would have won your bet. With a -1.5 handicap, Chelsea might be priced up as 1.95 with Watford at 2.0 having been handed their +1.5 goals. On this occasion, the -1.5/+1.5 handicap is where the Asian handicap line has been drawn in order to give both teams roughly the same chance of winning the bet. In essence, that is what AH is about; giving each team an equal chance of winning the bet. One of the big benefits is that Asian handicap can eliminate the draw, which is a fairly common outcome in football. Due to the handicaps on offer, one team is always going to come out on top. Which handicap you are betting on will determine how you calculate your return and it is this that puts some people off. But don’t worry, it’s simple enough and I am going to explain it all. I'll start with the three handicaps, then I'll show you what it looks like on Betfair and run through an example. Stake returned happens if the team with a -1 handicap wins by 1 goal or if the team with +1 loses by 1 goal. 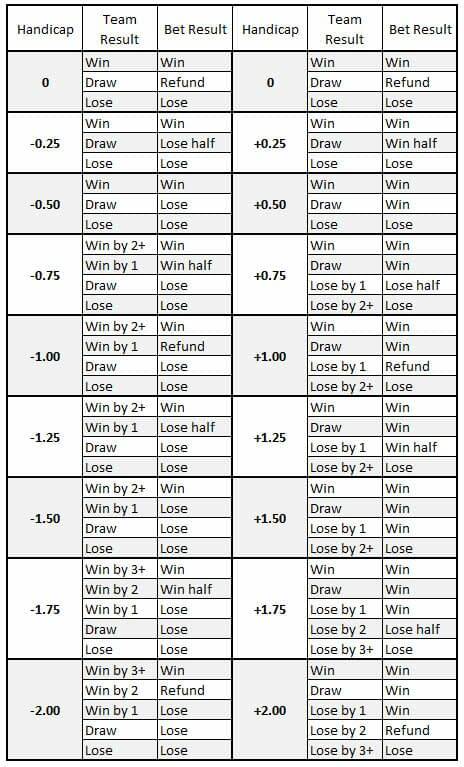 Here's a handy table which shows you the different Asian handicap lines and what needs to happen for them to win, win half, lose, lose half or for you to have your stake returned. 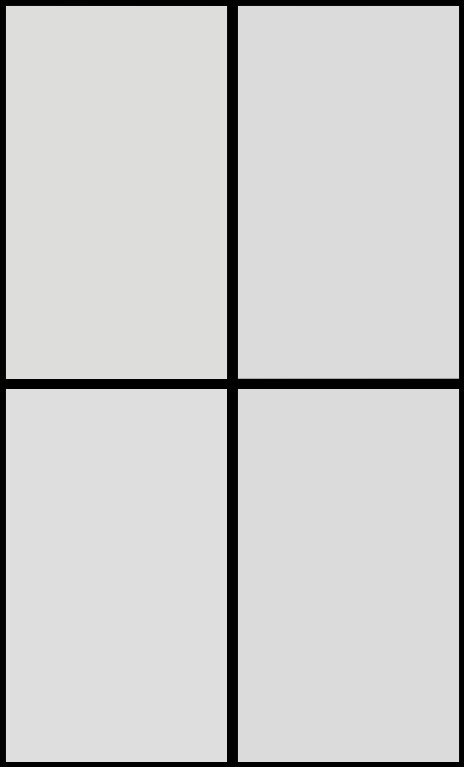 Click on the button below the table to download your own copy. The highlighted handicap here is Montpellier +1.0, PSG -1.0. This is because the two bets either side of the line are nearest to 2.0. Liquidity isn't great, but Montpellier are 2.04 and PSG are 1.87. In markets like this, you may get matched at slightly better prices if you ask for them. However, we'll work with the prices available for now so you can see how AH works. If you back Montpellier with a one goal start (+1.0) at odds of 2.04 and they win the game or it ends in a draw, the bet wins. If they lose by one goal, your stake is returned. Montpellier have to lose by two goals for the bet to lose. If you back PSG with a -1 goal handicap @ 1.87 they have to win by two goals for the bet to pay out. If they win by one goal your stake is returned and if they lose or draw then the bet loses. The game ended 0-1 so if you had backed PSG -1 your stake would have been returned, exactly the same as if you'd backed Montpellier +1. In the game below you can see that line is Hertha -0.5, Bremen +0.5. You can back Hertha with a -0.5 goal handicap at 2.12. This means if they win the game you win your bet, but if they lose then your bet is lost. If the game ends as a draw you also lose your bet because Hertha have a -0.5 goal handicap and that has to be taken off the result. On the other hand, if you back Bremen with a +0.5 goal start at 1.86 and they win the game, you win your bet. If they lose the game you lose your bet, but this time if the game is a draw you will win your bet. This game ended 1-1 so backing Bremen +0.5 was a winner, while backing Hertha -0.5 lost. Now we come to the quarter ball (or double) handicaps. These are slightly more difficult to understand than the normal half ball or full ball handicaps because, in effect, they are two bets rolled into one. Quite often, you will see them written down differently too. For instance, the -0.75 handicap may be written down as -0.5 & -1.0 so that you can see you are actually making two bets. Below, you can see Arsenal written down as -0.5 & -1.0 which is exactly the same as Arsenal -0.75. With this option you back Arsenal at -0.5 goal handicap with half your stake, plus back Arsenal at -1.0 goal handicap with the other half of your stake. If Arsenal win the game by one goal, you win your bet on the -0.5 handicap but your stake on the -1.0 handicap is returned to you. In effect it's a half win. On the flip-side, you can back Liverpool +0.5 & + 1.0. If Arsenal win by one goal you lose your bet on the +0.5 handicap but your stake is returned on the +1.0 handicap. In effect you have a half loss. The game ended 0-0 and, in this case, backing Arsenal on the -0.5 & -1.0 handicap resulted in both parts of the bet losing. However, backing Liverpool saw both parts of the bet win. As you know already, the aim of the Asian handicap is to give both teams a 50-50 chance of winning, which in turn creates a much greater angle for football traders. Let's take Hull City v Brentford as another example of how the Asian handicap works in practice. As you can see, Hull are fairly strong favourites to win this game. They are at home and a few places above Brentford in the Championship league table, which would ordinarily mean there is little interest in the match for football traders unless they can generate a strong angle. One possible way to do that would be to investigate the Asian lines, which may offer a more attractive way to side with Hull for the match. As you can see here, the Asian handicap has done its job perfectly and come up with an option where the two teams, Hull and Brentford in this situation, are very well matched. To recap, to bet on Hull -1 would mean that for your bet to win, Hull would have to win by two clear goals. If you were to back Hull -0.5 and -1, if they won by a single goal then half of the stake would be a winning bet and the other half would be returned. Betfair football traders are able to trade out of Asian handicap in-play, but liquidity is often poor. Switching to the Match Odds market in-play is usually the only option for adjusting positions after kick-off. One of the massive advantages for football traders who want to use Asian handicap markets as part of their betting strategy is the small margins taken by the bookmakers in this area. Traditional bookmakers will usually be seeking to make a profit of about 110%, but on Asian lines this figure comes down a lot, to around the 103% mark, and sometimes even lower. This means there are a lot of good value plays to be found in the AH markets for bettors who know what they are looking for. Why is this? Because Asian lines usually eliminate the draw as a possibility of an outcome, it means there are only two possible results - a home win or an away win - and traditional bookmakers squeeze a lot of their margins out of the draw market. Top Tip: The next time you are tempted to back a team in the draw no bet market, take a look to see what their +0 Asian handicap odds are as it works in exactly the same way. You might well be surprised at what you find! Think of Asian handicap in the same way as other markets you play. Search for value by summing up the probability and likelihood of an event happening, then consider using the Asian handicap lines. Keep in mind that as a football trader, it is not necessarily your goal to predict which team is going to win a match. Sometimes you will find great value in identifying a team which won't lose and an Asian handicap betting strategy can present some fantastic opportunities! At Goal Profits, we have an algorithm which identifies Asian handicap tips with plenty of value. Some members have even had good success with Asian handicap accumulators, though sticking to doubles/trebles is always the best idea. Now you know exactly how Asian handicap works, you can take advantage along with the many professional football bettors who already do. There's plenty of value to be found, so get hunting!